The blessing of the restored makai rock wall of the church was made on Sunday, November 24, 2013 following the 10:00 a.m. service. The blessing featured Nā Leo Nahenahe, the adult choir, singing “Ka Malu O Keawalaʻi.” What follows is the text for the blessing that was offered by Kahu Kealahou Alika. Below, the flowers of the earth. In the uplands, the trees of the forest. In the sea, the fish of sea. Come and see how beautiful the world. I luna la, i luna, nā manu o ka lewa. I lalo la, i lalo, nā pua o ka honua. I uka la, i uka, nā ulu laʻau. I kai la, i kai, nā iʻa o ka moana. Haʻina mai ka pū ʻana a he nani ke ao nei. Welina me ke aloha iā ʻoukou i kēia awakea. We are here to offer a blessing for the rock wall. Several years ago, the Board of Trustees began a discussion to complete the restoration of the makai rock wall. The discussion began in earnest, in part, because of the safety issues related to the massive deterioration of large portions of the wall. Through the work of Tom Nelson, a trustee and our liaison, with the Rev. Amanaki Ika, a Tongan pastor and stone mason, the work began this summer and was completed at the end of August. We are grateful to Tom and to Amanaki. We are also grateful to five donor families that helped cover the cost for the restoration work including the Hageboeck family of Minnesota, the Nesbit family of Florida, the Swindells family of Washington state, the Kapiko-Raymond family of Maui and the Garmar family of Oʻahu. The late Mary Kawena Pukuʻi wrote "Ke Ao Nani Nei" – the oli I shared with you a moment ago. Some say it was written with children in mind. As such it is meant to teach our children that they must be good stewards of the earth that has been entrusted into their care. So it is that we also must be good stewards. The restoration of the rock wall is an expression of our care for the land and for this sacred place. In the 16th chapter of the Gospel According to Matthew verse 18 Jesus declares in response to Peter’s declaration that Jesus is “the Messiah, the Son of the living God” – that the church will be built upon his declaration of faith. The Greek word for Peter that appears in the Bible is petros and the word for rock is petra. It is an interesting play on words. Some may say that this rock wall was built to mark the property line; others will say to keep the cattle (and now deer) out. I would venture to say that the rock wall marks this place as a pu’uhonua – as a place of refuge for all who enter this place. The rock here and the rock walls of the church are the physical foundation upon which our kūpuna have built a spiritual sanctuary. On a day such as this we give thanks not only for our ancestors but we also give thanks to the families whose gifts have made this restoration possible. Our blessing is with the lau kī and the pī kai. The lau kī or ti leaf is a sign to keep safe all come and go. The pī kai is to clear the way for a new beginning. He pomaikaʻi nei au i kēia pā pōhakū iloko ka inoa o Iesū Kristo. We offer a blessing for this rock wall in the name of Jesus Christ. Aloha ē! Aloha ē! Aloha ē! "Step by Step" by Cameron Keys of Kīhei has been published in a collection of poetry written by poets from 17 countries around the world. The book is called "Internaional Who's Who in Poetry 2012." The poem tracks his personal odyssey with cancer. Reprinted by permission. Lose my hair? voice? hearing? job? I chance the worst for music, the best for life. I hide my friendly eyes. Loving, caring eyes. She delights with my caress; purring and playing with my fingers. A ballet of colour and sound announcing Sprint. There is not pity in stranger’s eyes. Don’t they see? who have not had the same experience. Roy Weaklend, a member of Keawalaʻi Congregational Church, died on February 14, 2013. A memorial service in remembrance and celebration of his life was held on Saturday, March 2, 2013. The following reflections were shared by daughter Suzanne Perkins and granddaughter Jacqueline Perkins. Amongst the great sadness, there are many blessings. Having all of you here today to celebrate dad’s life is a blessing. Family and friends that offered love and support to us these last few months is a blessing. Hospice Maui is a blessing. I cannot give this organization enough praise. The most important thing to dad was to be at home. Your outstanding communication, care and can do attitude made for a comfortable transition for my father. Robert and Alika, dad’s evening caregivers, are a blessing. I don’t know what I would have done without you. You both display the best that humankind has to offer. My husband, Steve, is a blessing for making it possible for us to live on Maui. For dad, there was no greater gift. It was a blessing that my dad had a peaceful passing. I was serving him dinner on Valentine’s Day. He had a nice view of the impending sunset and was sitting in his favorite chair. The next instant he was gone. I believe he had a better offer! It was a blessing to me that my father believed in God. He was optimistic and a true gentleman. He loved his family, was steady, honest, and always persevered. I know this service had been hard on all of us. You lost a dear friend and member of our church community, my mother lost her father, and my sisters Kate and Anna and I lost a great grandfather. But this service isn’t about crying and being upset for our loss. Rather, this service is intended to celebrate my grandpa’s life. I can guarantee you there are a lot of things to celebrate about my grandfather’s life and the legacy he’s leaving behind. My grandpa has been so positive throughout his life. He lived through the Great Depression and then when he was just 18, drafted into World War II. His unit stayed out of any main contact with U.S. enemies, though any man, volunteered or not, to serve our country overseas is a genuine hero. Lucky for us he arrived home safely with a U.S. victory and no physical scars to prove it except for a chipped tooth. My grandfather was a true American. He knew all of our country’s patriotic songs by heart and every Fourth of July he would personally hoist our American flag out in front of our house. He truly loved everything good in the world - clowns, puppies and carousel horses. He loved reading. I would find my desk piled high with articles he thought I might find interesting. He always had a sweet treat around. My mom said it made him sweet. Grandpa was very encouraging and would try to drive to succeed. If I did 20 pushups, he claimed he could do 30 so I would try to beat his record. He adored every ray of sunshine and he loved bright colors. I have never seen him wear black. My grandpa was a very stylish dresser. He took so much pride in his appearance. He also took such care of himself. He went to the doctor, exercised, ate right, and spent 20 minutes each night brushing and flossing his teeth. We should all follow grandpa’s example and take good care of ourselves. He never got cross with us and he was always calm, cool and collected. My grandpa actually sort of reminded me of an elf. He had kind of blue eyes, a jolly attitude, and it seemed like he had an infinite supply of Life Savers in his pockets. Even when our friends were around he had enough to share. He heart was also very giving. Every Christmas he would ask us what we wanted and never mentioned anything he wanted in return. He was a very unique man. He always wore socks, ripped out ads from magazines before he read them, and he drove the only purple Lincoln I have ever seen. As for his persona, he was a tall man with not much hair, gleaming blue eyes - one of which had a twitch, very straight erect posture until the last few years, red-colored sunglasses and a woven straw hat. He was set in his ways as a good thing. He liked doing things his way and he had sheer dedication. When my mother was younger, my grandpa worked for Mobil Oil Corporation. His office was in Washington state, but he wanted mom to remain in her school in Oregon. So each week he commuted between Portland and Seattle. One of the greatest virtues that my grandfather possessed was patience. Even when he was ill and immobilized he was still very gracious to his caregivers. My grandfather was a socialite. He really cared about his friends and family. Each year he would spend hours on hand-written Christmas cards and other correspondence. When he came to our school performances he would always thank the director. He was always thinking of others. The thing that connects all of us here right now is my grandpa. He had a very strong belief in God and a huge devotion to this church. He came every Sunday for 26 years. I know my grandpa loved us with all of his heart and I know due to all of his wonderful traits he is living happily in heaven watching over all of us and smiling. Even though we can’t see him, he is still here for us. I love my grandfather and I will never forget the lessons he has taught me on being an exceptional person. Thank you for all you support, attending his service, and for giving me the honor to speak about him today. Robert & Beverly Gruman were married on December 21, 1947. 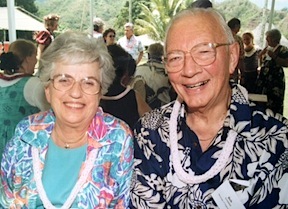 He is remembered by Bev and the ties they shared with Keawalaʻi over the years. Bob’s grandma Ada Sophia Whiting Jepson was named after Sophia Kilborn Whiting, an aunt. I had found a sampler in a book that Sophia had made at age 13 and had it framed. I also framed a receipt for 25 cents given for the ship Morningstar with pictures of Sophia and others that Uncle Manley hand copied from the old family Bible. Unfortunately these were lost in a fire and I don’t remember the year. Sophia married Captain Kilborn who sailed the Morningstar in 1819 to the Pacific. There was a story about Sophia walking the catwalk of her home, looking for a ship that didn’t come back. Keawala’i Congregational Church was founded in 1832 by Congregational missionaries. A group of Marshallese youth sang one Sunday and the collection helped raised monies to build a church for them on Maui. Their minister related the story of the Morningstar and how it sank in the Marshall Islands. We visited with him and he said he had been asked our questions before about the ship but it was sketchy. 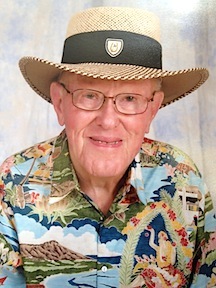 Bob became interested in missionary stories and felt a strong spiritual connection to Keawala’i. Almost every Sunday or our annual lūʻau, or at pot-lucks someone would share a soul-touching experience. It just became a part of our lives - grace abounds. Singing bass in the church choir with other great bass voices was Bob’s greatest joy. That we were able to do this in our twilight years was amazing. At 90 years old, the day before Bob died he sang with a strong voice. He was closest to God in that choir. We are so thankful for our Keawalaʻi memories that sustain us and give us comfort. God be with you till we meet again. I have lost a wonderful friend in the passing of Roy Weaklend. When I first came to Keawalaʻi, he became an immediate friend because he was always concerned about my well being. I will always be appreciative of his notes and letters expressing his thoughts and assurances of his prayers as I recovered from my bypass surgery. Today, I am saddened by his passing, but, he left me wonderful memories. A reunion of perfect love and eternal rest. And a church family whom you loved. Always in tune with those around you. As you did to your loving God. Whose richness will grace our finite lives as long as we live. We will see you as you now shine forever. John Fairbank shared the morning message on Sunday, November 11, 2012. As a way of honoring veterans, John invited the children of the church to present lei to veterans and to veterans’ widows and widowers. Fifty shell lei were donated by Hilo Hattie, Kīhei. Mahalo to Melanie Yadao, Manager of Hilo Hattie. The widow in today’s reading from Mark gave everything she had, all she had to live on. Today is Veterans’ Day and we remember those who have given of themselves for our country and its freedoms. November 11th is set aside to honor those who have served our nation in the Armed Forces - Veterans’ Day. November 11th was first set aside as Armistice Day to remember those who served in World War I. Later it was changed to honor all who served our nation. It became Veterans’ Day. It is a day that we honor and thank all those who answered the call to serve our nation. Many who served did so because they were drafted. Others volunteered for various reasons. None served because they intended to give their lives for their country, but many did make that ultimate sacrifice. As I said earlier I feel honored, yet humbled, that Kahu asked me to speak at today’s service. I am a Vietnam Veteran. I served there in 1969 with the 25th Infantry Division. For two years after that I was stationed in the Seattle, Washington area where a great deal of my work involved survivor assistance – working with families of soldiers killed in Vietnam. Many of you can remember that the Vietnam conflict was quite controversial. There were antiwar protests and demonstrations. But on this date thirty years ago in 1982 our nation put aside the differences and united to honor those who served, and especially the 58,000 who gave their lives in Vietnam. That was the day of the dedication of the Vietnam Memorial in Washington, D.C. Jan Scruggs and other Vietnam veterans had campaigned to have a memorial to honor the 58,000 who died in the service of their country in Vietnam. The effort was not without controversy. But the veterans persisted; raised the donations mostly from veterans; conducted a design competition, and Mia Ling, an Asian female architect, was selected to design the monument. That in itself caused controversy. Congress authorized the use of National Park land on the Mall in Washington, D.C. and the memorial was constructed. The efforts are narrated in a book by Mr. Scruggs, “To Heal a Nation.” And it was truly a healing event, not only for the veterans, but for the nation as well. Today, the Vietnam Memorial is the most visited memorial in Washington, D.C. Since that time, memorials honoring those who served in World War II and Korea have been erected. I was fortunate to be with the small group Hawaiʻi which attended the dedication on 1982. Our group included an Army nurse and a wheel-chair bound mother of a local Japanese-American soldier who had been killed in Vietnam. There were about twenty-five of us who were able to go. We raised some funds to help with the air fare and hotel expenses. We borrowed a Hawaiian flag from the color guard at the Army Headquarters on Oʻahu and off we went. We flew into L.A. where we joined other Vietnam veterans on a chartered flight to D.C.
all the way from Montana and had just arrived. The next day the groups of veterans formed up on the Mall by states and veteran’s groups and marched in the official “welcome home” parade. They were a motley group. Many wore the remnants of their jungle fatigues and others wore hats and caps emblazoned with their unit patches. We had quite a few join up with us, wanting to walk with the Hawaiʻi group. We all took turns pushing the local Japanese mother in her wheelchair along the entire parade route. We finally had people telling us - “Thank you for serving” and “Welcome home.” During the days before the dedication, raggedy-tag veterans had voluntarily formed a 24/7 honor guard at the base of the memorial. Individuals would stand guard for a couple hours until relieved by other volunteers. The volunteer honor guard was still standing watch when it came time for the official dedication ceremonies. All the VIPs and government officials had arrived. The Park Service security officials told the raggedy honor guard they had to leave but they refused. “This is our memorial,” they declared. There was a stand-off. Then the crowd, which numbered in the hundreds of thousands took up a chant - “Let them stay, let them stay.” So wiser heads prevailed and they let them stay and the official dedication proceeded. Our nation began its healing. So today, Veterans’ Day, we honor and thank all those who have served our country. There was a recent movie about a particular battle in Vietnam titled, “We Were Soldiers, Once and Young.” It is so appropriate. For those who served in all our wars and in peacetime as well, mostly have been the young men and women of our nation. Some made the ultimate sacrifice. So today we honor them all, and thank them for their service to our country. So if you know a veteran, or meet a veteran, especially those who have served in recent conflicts in Iraq and Afghanistan, take a moment and thank them and their families for their service and sacrifices. May God bless them all and God bless you. Amen. The following poem was a part of the message shared by John Fairbank on Stewardship Sunday/Veterans’ Day November 11, 10212. But, I never took a penny that wasn’t mine to keep . .
Little did we know that Trevor would live out the rest of his life with us. His owner left him with us while he returned to California to start a new life. His intent was to have us send Trevor later when he found a house with a yard. A couple of months later, he realized that he was not going to be able to find an appropriate place for Trevor that included a yard. He asked if we would like to keep Trevor, and by then we were in love with him, so the rest is history. Trevor was the ideal dog for he loved our back yard and would remain there for hours. When he first came into our lives, our yard had no fence. Still he would not venture beyond the boundaries of our yard except when a cat came into view. His one flaw was that he had absolutely no control once a cat was in his sights. His relationship with us was unconditional. He loved us. He loved other dogs. He loved children. He loved people. He loved to walk around the neighborhood. People knew his name, but not ours. Everyone knew Trevor. His presence reminded of God’s unconditional love for me. If there was an example of unconditional love, it was Trevor. He shared that love with us and with all who knew him. Sadly, in September, it was time for him to return to the source of that unconditional love, and we know God now has him in his special care. I thank God for Trevor. And you remained true and loving. They will comfort us forever. On April 1, 1946 the Aleutian Islands experienced a massive earthquake, causing a Pacific-wide tsunami. There was widespread destruction and loss of life when the tsunami struck the Hawaiian Islands early on the morning of April Fools Day. Several lives were lost and there was major destruction to the communities on the North Shore of Kauaʻi. As miraculous stories of survivors in the March 11, 2011 Japan tsunami were, so were the stories on the April 1st tsunami that struck the North Shore of Kauaʻi. With each tsunami warning over the years, I pause and think about the story of the 1946 tsunami on Kauaʻi. On that particular day, three of my siblings were late in their departure for school. My older sisters were having their hair done by my sister-in-law. Their daily route to school included walking out of Lumahaʻi Valley, through the Wainiha Valley, and on to Hāʻena School. It was a three-mile walk. As they walked that morning, my brother and two older sisters noticed some unusual changes in the Lumahaʻi River. As they approached Wainiha Valley, they could hear people shouting. My father and other workers of the Robinson family who were on a hill across the valley were trying to warn the three children as they walked down towards the lower part of the valley. The workers had already witnessed the first of many waves to hit the islands and they had escaped up into the surrounding hills. But my brother and sisters were not sure what direction the voices were coming from. At the same time they noticed that the Wainiha Bay was emptying out. They realized something was very wrong and ran up the hill on the side of the road. Had they not been detained by my sister-in-law for those few minutes, they would have been in the middle of Wainiha Valley where the waves had come and destroyed the village. During these same moments, my oldest brother saw his house floating in the middle of the bay as the third wave in the valley was receding. It had destroyed most of the homes in the valley. In just a few moments, his house broke apart and disappeared in the raging water. His wife and infant daughter were at home when he left to pick up the Robinson workers. He did not know that his wife had escaped the house as it was floating away from its foundation. She had been able to run up the hill behind the house. Life is often taken for granted. But I know that unusual circumstances can alter our lives. I am extremely grateful for the few minutes that my sister-in-law detained my older brother and two older sisters. Their lives have had a tremendous impact on my life. I know life would have changed dramatically without them. The three of them have helped to forge a path that led me to the place I now stand some sixty-five years later. As I watch the miraculous stories from Japan, I am thankful for the miracle that took place in Lumahaʻi Valley. When such miracles occur in our lives, let us always be thankful for the fullness of life. All along the way our lives are blessed. We know not why, but when we accept these events as gifts, our lives will be greatly enriched. The theme for the 2010 Hoʻokupu Makahiki or Annual Appeal focused on butterflies. Several members and friends responded with their own stories about butterflies. Among them was a letter received from Lowaena Hau of Kaʻahumanu Congregational Church, Wailuku. This morning I saw another caterpillar making its way across the (church) parking lot to find the right little tree with a big leaf to transform itself into a beautiful butterfly and I thought about . . . the message that was in your (letter for the annual appeal). Nowadays I try to look out for those humble little guys slithering across the pavement to find freedom, to gift themselves to the eye of the beholder amidst the dangers that may hamper their feat before they even have a chance to (be) transformed. It is very early in the morning that I see them as though racing to get to the other end of the pavement. The birds and the chickens are still in the trees and the cars have not come yet but they will very soon. I bend down and pick up God’s creation to take it where it is safe inside the gate and it will find that leaf to transform itself into that beautiful butterfly. Isn’t it incredibly fascinating? We are as the caterpillar, hurrying away from the dangers of this earth to reach God before we get swallowed up by the evils of the world. Mahalo to Ke Akua for his wonderful love and grace and for (being reminded) that God’s creatures and creations make us humble – a beautiful message of creation that goes further than science. God is love. On Sunday, August 8, 2010 Taka Harada shared his thoughts and reflections about Auntie Caroline in a sermon he preached that day. We include his thoughts and his poem here. Auntie Caroline De Lima was born on 1917 in Waikīkī, Oahu. She died at her home in Kahului on July 20, 2010. A memorial service in remembrance and celebration of her life was held at Keawala‘i Congregational Church on Saturday, July 31, 2010. I still remember Sunday, June 4, 1996 as I attended Keawala‘i for the first time to worship. It was a lonely time for me as I just left the church I had served for thirty years. I was greeted by Bill Richter outside the church doors. As I sat by the makai window, Auntie Eleanor was there to make sure I was comfortable. As service began, I saw a tiny woman seated next to Kahu. As the service began she stood up and led the congregation in “The Lord’s Prayer.” Something about her stuck with me. Throughout the years as we sing “The Lord’s Prayer” in the morning service, I often think of her. As the years passed, I learned a lot about the tremendous impact she had in keeping this church a spiritual “pu‘uhonua.” She now joins many that have been spiritual leaders who kept the doors of this special place open. Living the life God gave you with grace! Or, when I see your children! Your name now added to a wall of Memories! Left in our hands to continue to the finish line! You live forever in our memories! Sue Johnson is family to Keawalaʻi Congregational Church through the Cockett ʻohana. Her father Christopher Cockett was born on July 29, 1895. He died on July 21, 1987. Her mother, Mary Cockett, was born on January 21, 1908 and died on November 17, 1988. What follows is her memory of the story of one of two brass whale oil lamps that remain from several lamps that once hung from the church ceiling. The following story is what I remember about the history of the brass whale oil lamps which King George gave to King Kalākaua and that King Kālakaua gave to the church. Sometime about what I think was 1975, my folks were at the church cleaning it up, and they found some remnants of old brass lamps “under the church,” according to my mom. They apparently found several lamp bases, in varying degrees of disrepair, and several shattered glass shades, along with two unbroken shades. They brought them home. As there was only one bright pink glass shade and one aqua blue glass shade, they decided to restore only two lamps. I remember my dad enjoying working on them, kind of reshaping then putting them together, polishing them. When the lamps were restored, my folks did not know what to do with them. At that time Keawalaʻi had no regular minister, only short-term ministers who were often semi-retired and who would come for 90 days and then leave. My folks were aware that the lamps were valuable and they didn’t just want to leave them at the church. I can remember her walking up the road every Sunday, carrying them to church, and placing them on either side of the altar. My dad died in 1987 and when my mom died in 1988, I did not know what to do with the lamps as I was living on the “mainland” full-time and I wanted them to remain in Mākena. As the church still had no regular minister, I decided to give them to Auntie Caroline DeLima since she lived close to Keawalaʻi and since I knew that she, too, would take good care of them. That’s my story. I know my mom is happy knowing that at least one of the lamps has been returned to the church. Beth Gawain of Kīhei was one of the founding members of Nā Leo Nahenahe when the choir first met in February 1998. For over a decade Beth has been a faithful member of the choir and church, having also served as a trustee. On Sunday, September 27, 2009 Stephen Haines, Choir Director, presented Beth with lei as an “Affirmation of Ministry” for her years of service. Beth shared her thoughts that day about the significance of music in her life. Here, she shares her manaʻo further. On Sunday 17 September 2009 the Keawalaʻi Church honored me by giving me a very beautiful orchid lei. I was being thanked for years of singing in the choir and serving on the Choir Committee. I was deeply touched. I spoke of how much I’ve always loved to sing. Although my voice is nothing special, I can carry a tune, and love using song as a way of expressing ourselves and as a way of being together. From the smallest child I’d join with my mother singing as she worked around the house or did handcrafts. Now people turn on the radio, but our real blessing was that THERE WAS NO RADIO yet. This was early 1920s and radios were not yet common, and anyway there were no music broadcasts. Until we had a wind-up Victrola, the only music in the world was LIVE music. When people got together in the evenings, they sang. Many homes had a piano and there was always someone who could play well enough to lead. There were also banjos and harmonicas. Everyone sang. It didn’t matter at all if someone didn’t sing well. It was what we did together. I’m interested to notice that all over the world it has been common in human evolution – that a tribe would gather and they would sing and dance. It was an early form of expressing that we are “us.” To vocalize rhythmically is a way of bonding, and of celebrating or mourning. It is also a way to work up energy for a group effort, or to give rhythm to group movement that requires coordination, such as paddling or heaving a heavy weight or swinging hammers and axes. A particular song would express the identity of one group from another. Each team or fraternity or church tended to have a particular song. If you heard YOUR team’s song among a group of strangers, you knew at once that someone here is “one-of-us.” When singing “our song” together, as at the end of a gathering, we all sing with particular fervor and feel deep emotion and belonging. So that is what I’ve experienced singing in the choir. And singing four-part harmony is especially bonding because together we are creating this GLORIOUS sound that none of us can make ALONE. We, each of us, must be very aware of how the note that I am singing relates to each of the other tones and how my sound must be just SO, to combine and blend and do its share to make such magnificence. And of course singing in this space, this church, with its perfect acoustics, and so much mana! A great privilege and one of the treasured memories of my life to praise God in this so satisfying a way all these years. On April 14th we had breakfast at the Asakusa View Hotel. We were looking forward to the visit to Kusatsu City, an area known for its onsen or hot springs and ski resorts. We were on the second leg of our trip. We traveled for 4 ½ hours to visit the Kuriyu Sanatorium located in Kusatsu City. Little did we anticipate the tremendous emotional experience that would result from this visit. It was to a place where history records some of the most horrific stories told about patient suffering and human misery. Kusatsu City is located half way up the mountain range that surrounds the city. As we approached the city limits, steam could be seen in the forest and within the city. It reminded me of the Big Island Kïlauea Volcano area where the steam and sulfur smell of volcanic activity is everywhere. The only difference was the 40 degree temperature and the beautiful sakura in full bloom. After the long ride to Kuriyu Sanatorim, we were greeted by Akiko and Mr. Fujita, whom we met in Kalaupapa at our annual Ka Ohana Kalaupapa meeting. We had a tour of the facilities and visited the notorious jail-like holding facilities which sanatorium authorities used to punish patients who were disorderly. Many died in this facility. It was closed when patients and families protested the inhumane treatment of patients at this facility. It was used during the early years of Hansen’s disease treatment. The rooms were no larger than 5 feet by 5 feet with little sanitation and the winters were extremely cold and many died from the exposure to the elements. We were then taken to the memorial where the ashes of patients and of the innocent aborted fetuses were enshrined. It was a difficult reminder of the visit to Suruga and the reminder of Takatsu. It was a beautiful area where pine trees and other tall trees surrounded the memorial. After this visit, we were taken to our quarters and assigned our rooms. As we disembarked from the bus, I noticed the area was surrounded by snow-capped mountain ranges. It was spectacular as I took in the awe-inspiring surroundings. It brought back memories of how beautiful Kalaupapa is today. The area creates the same feelings and you become consumed by the peacefulness and beauty of the area. It was here, that we were privilege to talk with Mr. Sakurai, whose daughter Mariko is memorialized with the others whose destiny was caught up in the hysteria and fear that surrounded those discovered with Hansen’s disease. I previously shared what followed in our interview with Mr. Sakurai. In the early morning of April 15th, I had gotten up early morn to do my writing. I opened the back door of my room. Before me was one of the most spectacular sights I have ever seen. Far beyond the city limits were mountain ranges that clearly outlined the morning skies. There were fingers of light shooting into the dark morning skies whose magic slowly changed the sky from gray to light orange to bright red. As I beheld this sight, I was overwhelmed by the scene before me knowing that this was witnessed so many times before by patients seeking hope and healing from the scourge of Hansen’s disease. All the words of the previous days and nights rang within my soul. It was so difficult to know how much pain and suffering those who viewed this sight endured for the rest of their lives. There was little hope and yet this scene perhaps offered the only hope for every patient that stood at this door taking in this spectacular sight. The sunrise held a different meaning for the beholder! That might someday overcome the hopelessness of the moment! A spark in each beholder! Of hope and love to lift their tired souls! Illuminating pride, wholeness, and freedom! An eternal story of hope for all mankind! the emerging sunrise gives me hope! Will rise and live again for all mankind to hear your message! Violently taken from the warmth of your mother's womb! You became more than a fetus to me! Why is man so fearful and intolerant? Why is man so scared and frightful? When will we learn the lessons of the past? When will we begin to trust one another? Like the snow on top of the mountain. Like the unfolding story of your spirit! Like the birds I hear all around me! To feel and hear your story retold for all the world to hear!